We’ve had the 5th Wheel a little over six months, and it was cleaned before we moved it off the lot at the dealership, but the outside has not been washed since then for several reasons. First, most of the parks in which we have stayed do not allow campers to wash at the site. Winter weather has been a huge factor for not yet attempting the big clean, and there were other reasons. To make sure it did get done in a timely manner, it was on our “to do” list for April as we were thinking twice a year would be good. It took two or three hours in warm temps yesterday, but Jim got the job done. 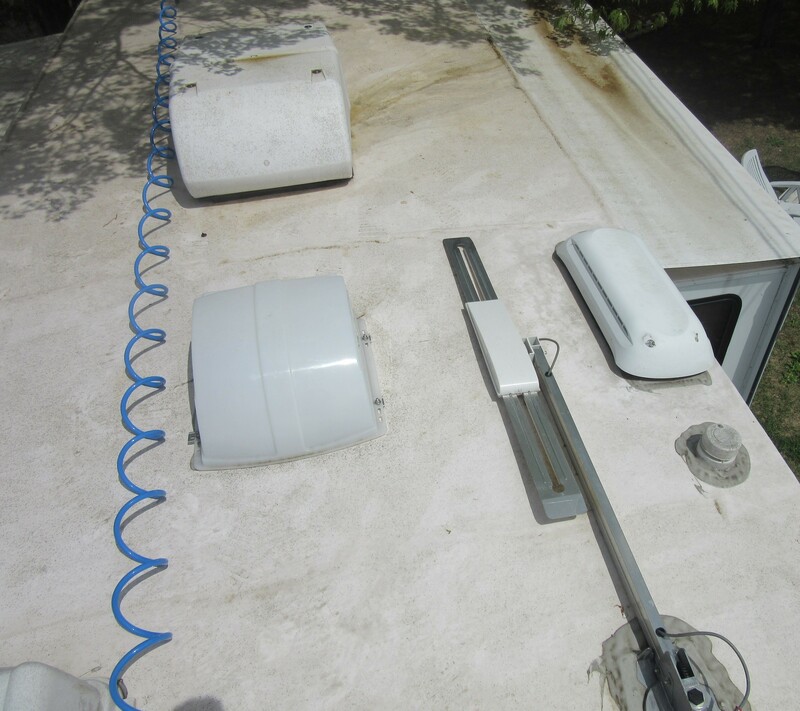 During the process, we learned a few things about our RV and cleaning it. First, Jim climbed up on the roof and swept all the leaves and things off of it. 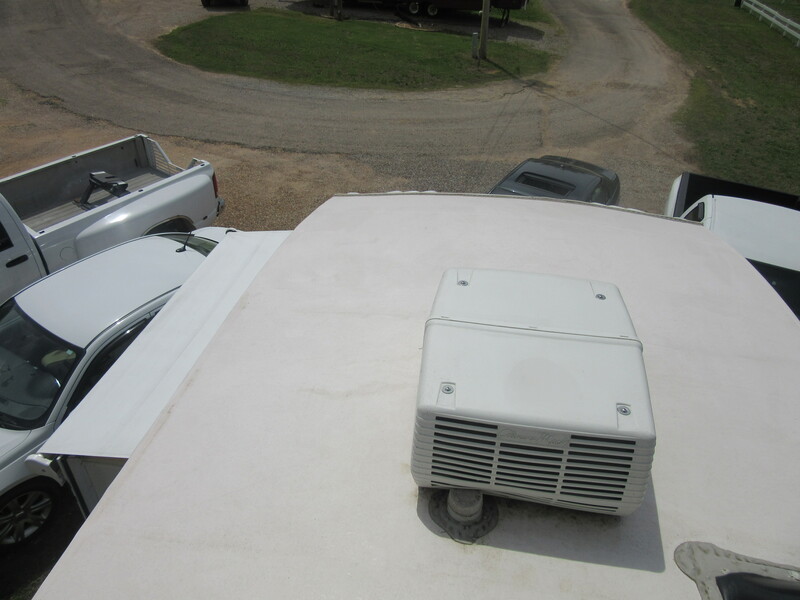 He hooked up the general purpose water hose, attached a sprayer, and went back up on the roof. I turned on the water for him and helped him guide the hose, undoing kinks as it went, up top. After he’d rinsed of as much as he could with just the sprayer, he attached a cleaning brush and scrubbed the next layer of filth off our rubber roof and slide awnings. The unexpected issue was a good bit of staining near and running from the main air conditioner, which we’ve been using frequently the last month or so. It was too hot in Mississippi not to use it, and the pollen from Meridian on up to where we are now near Savannah, Tennessee, deems it prudent to keep the windows shut and run the air as needed. We did not realize it would cause this staining. Now, we need to research how to better clean this area and ascertain whether or not there is something we can do to minimize the amount of air conditioner run-off that actually spreads out over the roof. In the meantime time, he used a bit of Dawn dishwashing liquid to clean the stains, knowing we must be careful about the type of cleaners used on the rubber roof. 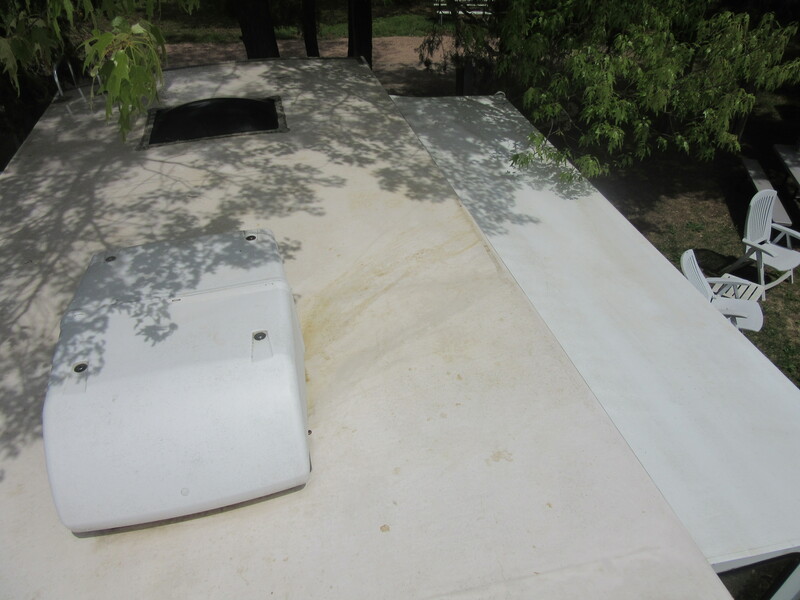 Below are some before and after roof pictures (unfortunately, we still have some staining near the AC as mentioned). 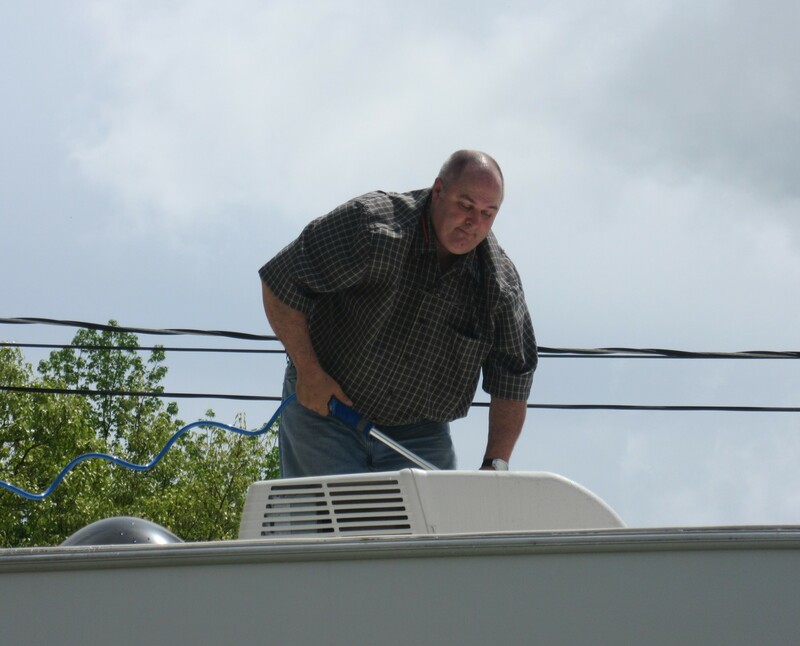 After cleaning the roof, Jim used dishwashing detergent and the scrub brush to wash the sides. The cleaning problem on the sides was the black run-off marks did not come off well, so we’ve ordered some cleaner that claims to remove these black marks. 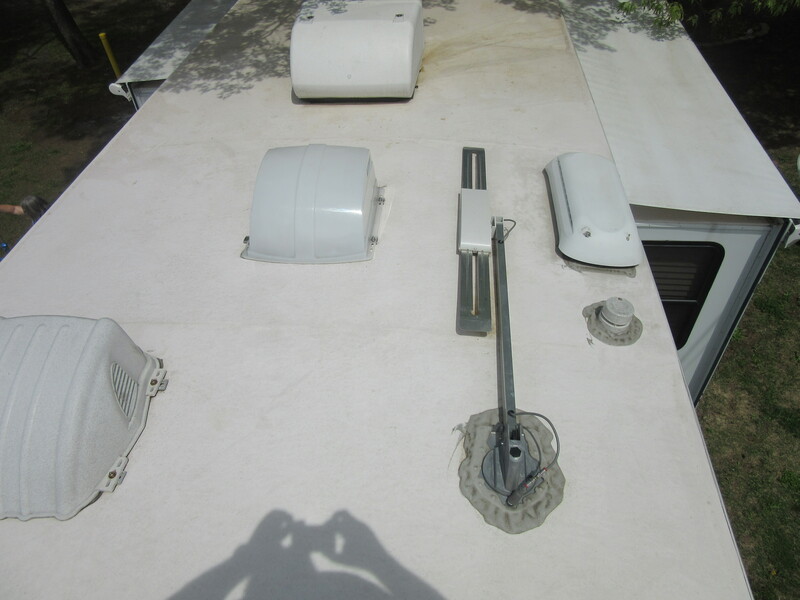 Hopefully, the next time we make pictures of the outside of the RV, those black marks will be gone. 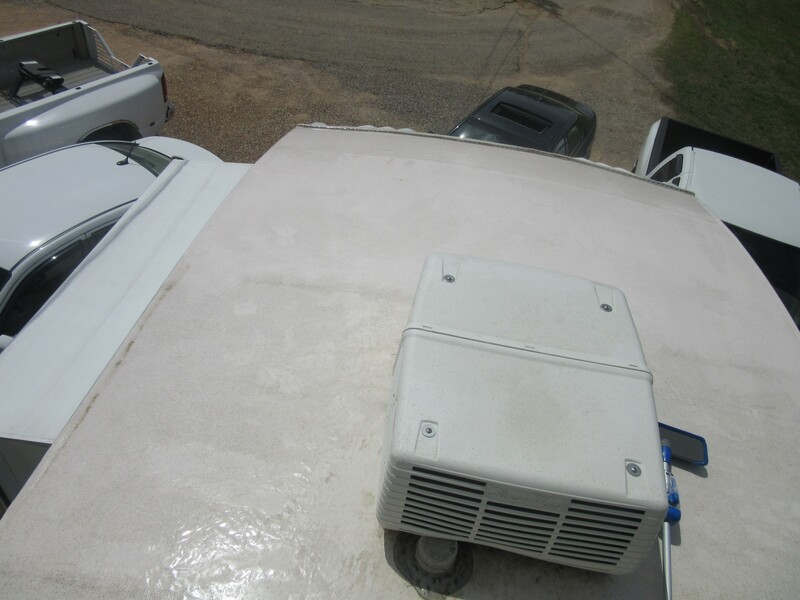 Of course, we’ve learned that keeping the roof clean helps reduce the amount of black marks down the sides. Again, here are two pictures: one before the sides were washed and one after. If anyone has suggestions on better or more time efficient ways to clean and care for our 5th Wheel, we’d appreciate hearing about those ideas. Me too, I need to wash mine soon. I have some Ocxie Clean for outdoors-I will go get it tomorrow and see if you can that on your new moving home! 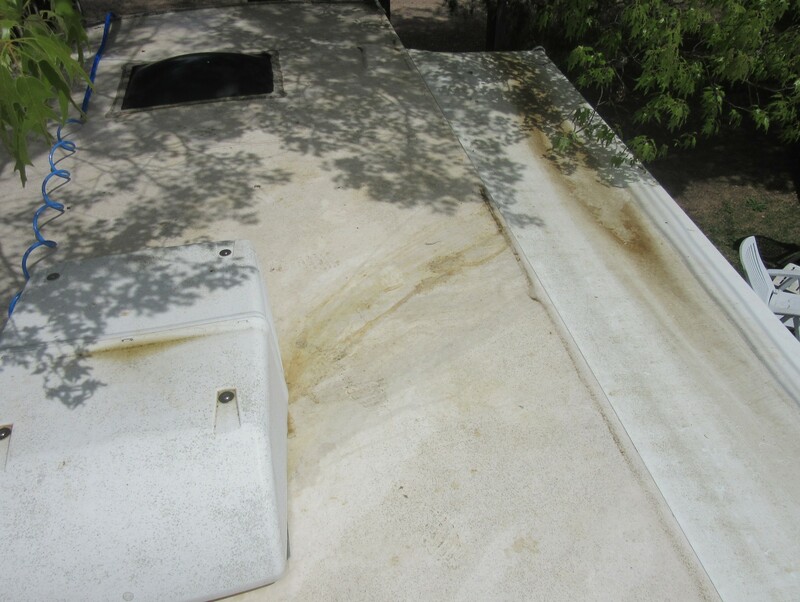 The roof is rubber and there are a number of chemicals that would deteriorate it if used. I tried Dawn and it worked pretty good. We found a black streak removal liquid made specifically for RV’s and I will try that next time. I thought of baking soda and might try that if the streak removal liquid doesn’t work. 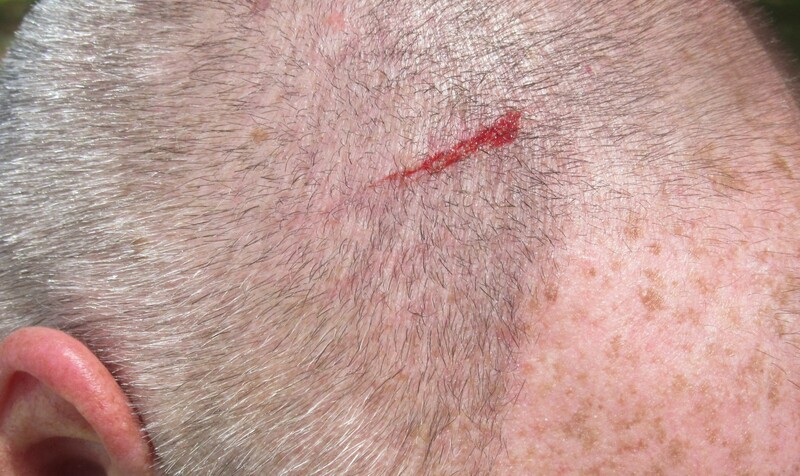 Not sure peroxide would be good for it. Thanks for the help. We are still learning.